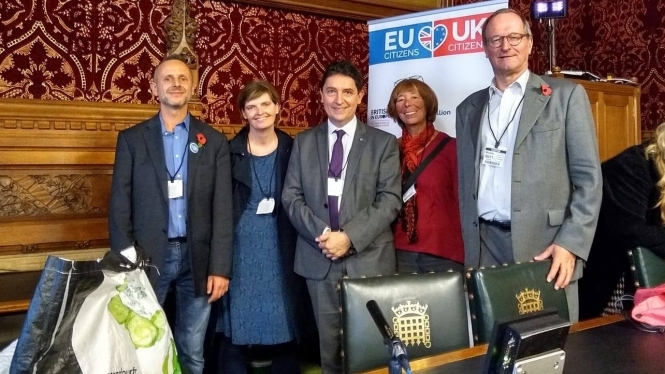 Campaigners in Westminster yesterday urged the British government to guarantee all of the citizens’ rights part of the Brexit deal negotiated so far and ask the EU to do the same – so there can be an ‘article 50’ deal on this aspect as a minimum. Rather than no deal at all, that would create a binding treaty safeguarding the full negotiated rights for the future, and protecting them from future changes by individual governments, the campaigners say. In fact article 50 itself merely says there should be an agreement on arrangements for withdrawal but does not specify what it has to contain, so if all else fails the 'deal' could contain only citizens’ rights, and does not have to include the other matters such as the Irish border question, said British Community Committee of France chairman Christopher Chantrey, who attended yesterday. “It went very well and we had absolute solidarity between the British in Europe and the3million [representing EU citizens abroad in the UK],” he said. The call was backed up by a letter handed to 10 Downing Street (read it here) after campaigners formed a human chain from Parliament Square and at the Last Mile citizens' lobby at Westminster during which UK MPs from all main parties spoke in support – as well as French Senator Olivier Cadic who said he had asked the French government to guarantee the citizens’ rights agreement for British people in France. A rights part of the deal has been fully agreed between the UK and EU (though the campaigners consider it falls short of the ideal of maintaining all existing rights). This comes as the French Senate prepares today to debate a bill giving the government special emergency powers to pass new laws to deal with the difficulties that would follow from a no-deal Brexit, including regarding the legal situation of British people in France. Mr Cadic said yesterday: “As I said in the French Senate, I am not talking about tomatoes, bicycles or cars.I am talking about men, women and children. “These are the people who will be directly affected by Brexit - and most of them were not entitled to participate in the referendum. “They worry about their future. Will they still be able to live where they are? What will happen to them in the event of a no-deal?” (read the rest of his speech here). Mr Cadic added he favours another referendum, in which EU citizens in the UK should also have a vote. In parallel with the mass lobby event yesterday, in the main House of Commons chamber Labour MP Yvette Cooper asked a question about the rights of EU citizens in the UK if there is no-deal, which led to a debate. Minister for Immigration Caroline Nokes said that in the event of no-deal “all EU citizens who are resident here by March 29 will be welcome to stay”, including their close family who live with them. She said that contrary to previous reports, there would be no tough checks on their right to work and they could continue to do so with their passports or ID cards. They will have to apply for the UK’s new ‘settled status’ scheme but there would be a “reasonable and sensible transition period” to allow for this. ‘Settled status’ has now been put into UK law (thus offering more protection at present than exists for Britons in the EU) and aims at confirming the status and rights of EU27 citizens in the UK as worked out in the negotiations with the EU. Ms Noakes said: “It is important that individuals are given as easy a journey as possible through the process” and that “there should be a ‘computer says yes’ attitude, rather than ‘computer says no’” (referencing a popular British comedy show). New immigration arrangements would be put in place for those coming after Brexit, the minister said, based on an immigration act which is to be debated shortly. There would be no free movement from the EU but people would be admitted “based on people’s ability and what they can offer to our country”. The minister said the UK government did not favour seeking ‘ring-fencing’ via article 50 in the event of no-deal and she said that the UK had been encouraging the EU and the other EU countries individually to offer similar guarantees to British people in the EU as in the UK’s ‘settled status’ scheme. However the campaigners for the rights of citizens living abroad point out that unilateral guarantees fall short of the full negotiated deal – for example the negotiated deal requires the UK to respect not only rights of EU citizens to live and work in the UK but also to uprate pensions of Britons in France and pay British pensioners’ healthcare costs in France and allow them to continue to claim certain UK disability benefits. What is more, unilateral guarantees could be changed in future and do not give certainty for the rest of people’s lives. The UK recently presented a bill offering to continue paying for British pensioners' healthcare in the EU as part of separate deals with the EU or individual states.